The God of peace, who brought again from the dead our Lord Jesus, the great shepherd of the sheep, by the blood of the eternal covenant, make you complete in everything good so that you may do God’s will, working in you that which is well-pleasing in God’s sight; through Jesus Christ, to whom be the glory forever and ever. Amen. I have participated in two events in the life of the church this year more than ever before. The first event has been attending the ordinations of dear colleagues in ministry. In the past six months I have traveled from Grand Forks, ND to Omaha, NE and Watford City, ND to Kerkhoven, MN. The second event is presiding at funerals for brothers and sisters in Christ who have gone before us and now rest forever with the communion of saints. As of August 1, I have presided at twice as many funerals as I did during the entire year of 2010. You may be asking, why I would share these two very different events in the same reflection? Primarily because I don’t think they are all that different anymore. An ordination lifts the one being ordained to serve in the Ministry of Word and Sacrament. It is not because of what this individual has done, but because of what God has done and is doing in this person and the entire community of faith. Our God of peace is present and active in the celebration of ordination. At a funeral, we worship together as a community in our time of grief and are reminded that we are never alone in our journey, not in life or in death. It is a time when we remember a dear sister or brother in Christ, offer prayer for God’s comfort, and rejoice in the promise of resurrection that we are given in baptism. Our God of peace is present and active in these times as well. 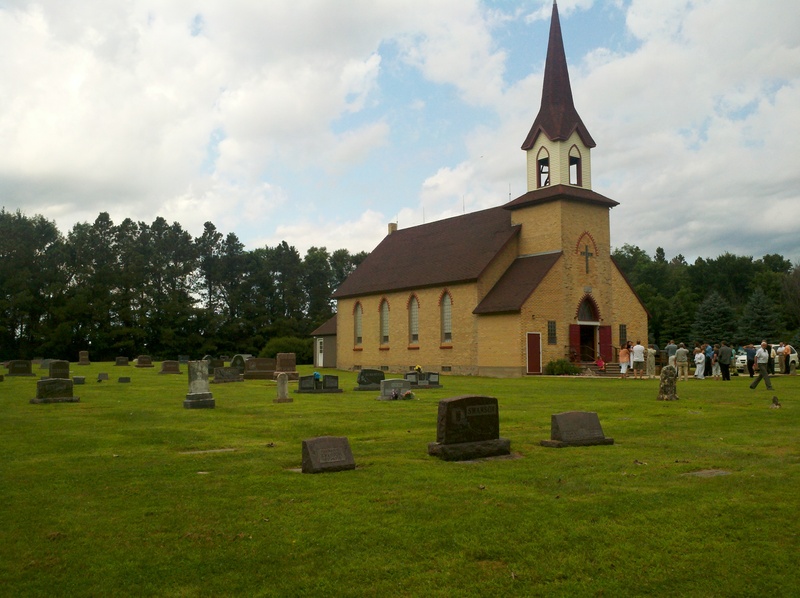 The cemetery is next to the sanctuary of St. Joseph Lutheran Church in Rosholt, SD. I received the blessing offered above in a new way while attending an ordination at St. Joseph Lutheran Church near Rosholt, SD. As the Rite of Ordination was taking place, and this blessing was being offered to newly ordained Rev. Sheila Pohl, I glanced out the window of the sanctuary. I was overwhelmed by the view of the cemetery that surrounds this prairie church that was built in 1884. I could feel the presence of the saints that rest in this cemetery as they joined us in celebrating the first ordination ever held in this place of worship. The blessing of God’s peace is not only for those who grieve while standing at a loved one’s graveside or in the joyful celebration of an ordination. The blessing of God’s peace is for all of us; in times of grief and joy, in places of work and rest, when we are ready to receive it or least expect God to be there. Through our savior Jesus we are joined together with the communion of saints – the living and the dead. Dear saints of God, may God’s peace be with you. This entry was posted on Friday, September 9th, 2011 at 8:34 pm	and posted in The Church in The World. You can follow any responses to this entry through the RSS 2.0 feed.